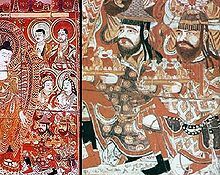 Sogdians donors to the Buddha (fresco, with detail), Bezeklik, eastern تارم طاس, China, 8th century. ↑ Jacques Gernet (31 May 1996). A History of Chinese Civilization. Cambridge University Press, 282–. ISBN 978-0-521-49781-7. ↑ (1 جنوری 1996) History of Humanity: From the seventh century B.C. to the seventh century A.D.. یونیسکو, 467–. ISBN 978-92-3-102812-0. ↑ (2013) "Sogdian", Glottolog. Leipzig: Max Planck Institute for Evolutionary Anthropology. ↑ Utz, David. (1978). Survey of Buddhist Sogdian studies. Tokyo: The Reiyukai Library.